Over the last few months I have shared with you a selection of the most frequently used jigs in my workshop. The specific requirements for a jig alter as the emphasis shifts between safety and efficiency with neither one dismissed entirely. Complex jigs represent a significant investment in time and materials so it pays to design these with an eye on multiple use. 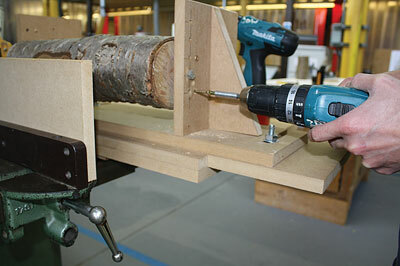 This jig has been developed to allow me to convert logs into planks on my bandsaw and has a number of built-in features to make the process easier. 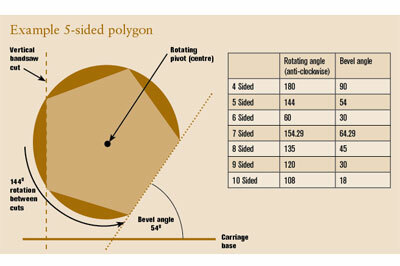 It can be set up to cut diagonally through the log, which can be rotated to produce tapered polygons with any number of sides. 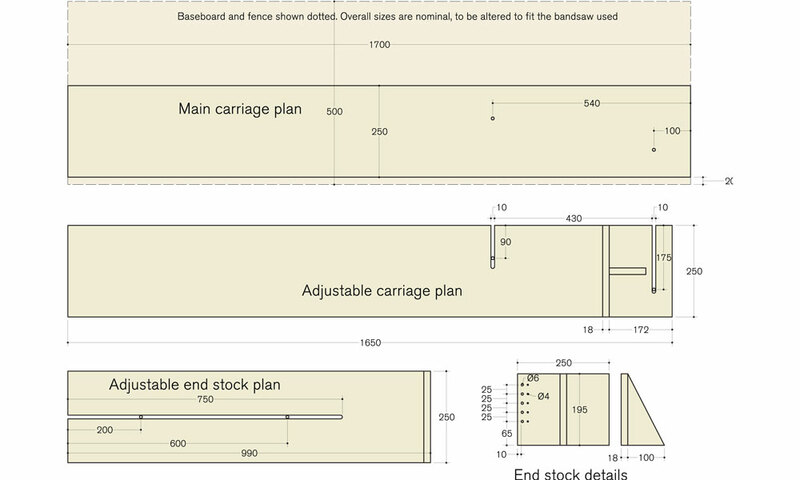 This example will allow you to work with stock up to around 255mm in diameter and I have stated some dimensions for the construction. However this can always be scaled up or down to suit your requirements, taking into consideration the limits of your machine. Maybe it goes without saying but it is particularly important to have your bandsaw running accurately to get the best results with this jig. After some experimentation I discovered the blade that worked the best was a 12mm 4tpi. The blade cut well with a slower feed rate and to resist drift I introduced slightly more tension on it than recommended to compensate for the extra height of the guidepost. You may find this varies from one machine to the next and if you intend to do this in any quantity you should certainly step up to a 20mm to 25mm blade. The first step is to cut a baseboard that covers the right-hand side of the machine bed, leaving 10-15mm clearance between the edge of the board and the blade. Attach a 20mm strip to act as a guide. On the underside screw a few strips of MDF to locate the board on the table. 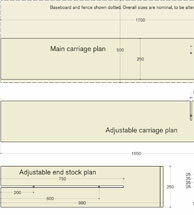 The moving carriage is made up of four components. First, cut a board similar in length to the baseboard and around 250mm wide. This could be made longer and would depend on what size logs are used. This will be the main carriage that slides over the baseboard against the guide. A bit of candle wax on the two edges helps to make it run smoothly. 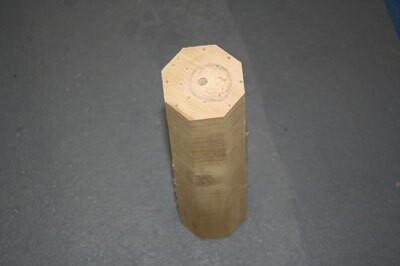 Mark two holes, 100mm and 540mm in from one end and drill two 8mm holes; the underside will require countersinking to accommodate bolt heads. Cut another board the same size as the previous piece. 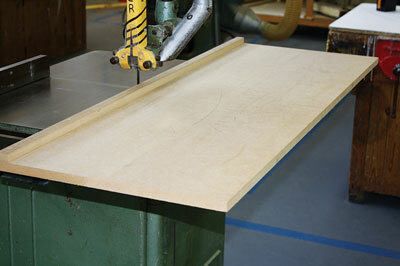 This will be the adjustable section that can be set for straight or tapered cuts - the 'taper board'. 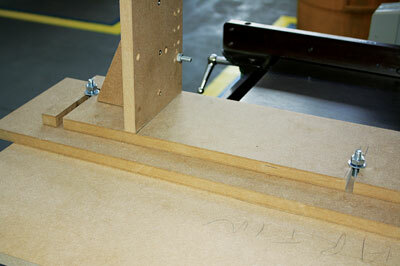 Use the holes previously drilled on the carriage to mark slots in from one edge. Make these 2mm larger as it helps adjustment when operating the jig. 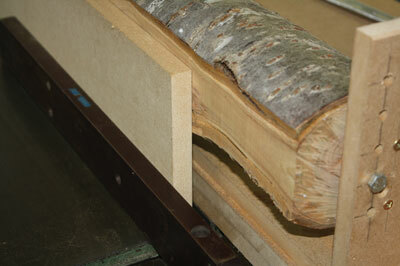 The next stage is to make the end stocks that will hold the material in place. One is fixed and one is adjustable. On one face drill a series of 6mm holes, 10mm from the edge. This will allow for the bolt that holds the work piece, effectively between centres. I put the first bolt at 65mm from the base and then at 25mm intervals. It's also worth drilling a series of 3.5mm holes for screws which can be used for securing the work piece in place during operation. The adjustable end stock needs a long base with a slot cut down the centre to accommodate two 8mm bolts. Once you have cut this it can be used to transfer the marks for the two bolts that will secure it to the baseboard. These bolts are important to prevent twist. 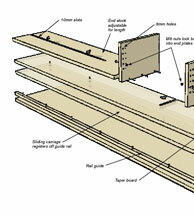 If you are cutting longer stock remember to make the baseboard longer. New bolt holes will have to be drilled for use with larger stock. Select your stock and drill a 6mm hole in each end, as close to the centre as possible to take the 6mm bolt. It is important to drill clean holes as a loose fit will permit misalignment and affect your cut when tapering. Now position the log onto the fixed end stock then slide the adjustable end stock up, position the bolt in the hole and lock it off tight. Drive two screws close to the middle in each end to finally secure the work piece in place. Adjust the taper slide so it takes a small slice as parallel as possible in relation to the stock piece. 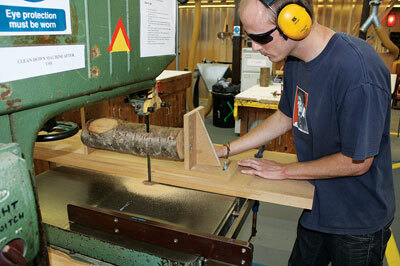 Now set the fence on the bandsaw to the desired thickness of your next cut. Loosen the taper bolts and slide the flat cut up to the fence. The fence needs to be taller and may require an additional face plate. 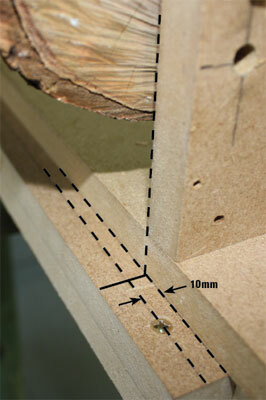 I use a piece of 18mm MDF which is held in position with double-sided tape. You can now re-tighten the bolts and complete the cut. Repeat the process as many times as necessary until you get near the centre of the stock stop, then reset and work from the other side. This requires a bit of extra thinking and basic maths, but nothing too complicated. I've provided a table with some of the most common options. 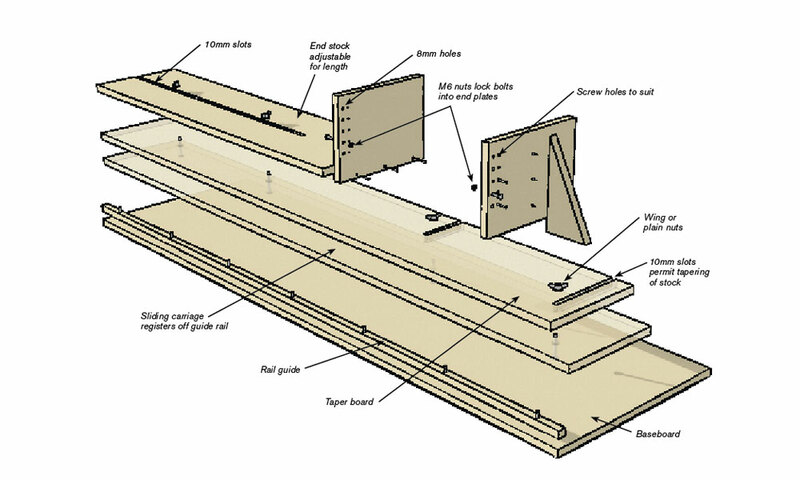 For even numbered polygons the calculation is simple because the sides have a parallel match all the way round and the use of a sliding bevel is the most convenient method of setting the required rotation of the stock in the jig. To set the taper draw a pencil line along the top of the guide; I used the line that I drew to mark the screw holes for holding down the fence. For a 10mm taper set the angle by referencing off the line at either end of the log, 10mm at one end and zero at the other. Make sure all the moving parts are secured and make the first cut. Remove the screws and spin the log between centres on the bolts and match the cut edge to the bevel. Secure back into position with the screws and make another pass. 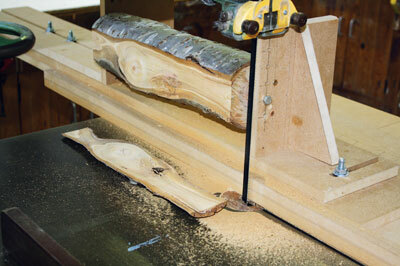 Continue to work around the log repeating the process, each time referencing off the previously cut face. On completion the ends of your log will have gained lots of holes. This may be something you need to factor in when cutting the log to length prior to shaping unless you are confident they can be absorbed into any subsequent joints. The process requires more than the usual amount of blade to be exposed so exercise caution and work slowly and methodically through each step. 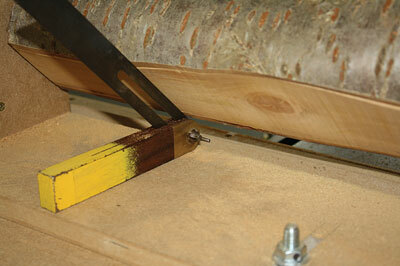 Take time to ensure that the log is secured at both ends with screws before each pass.